Question: Is exercise more dangerous in cooler weather? I've noticed my dog can run around much longer without getting tired when the weather is cooler than when it is very hot - it's quite amazing how much energy he has when it is cool. Is this all relative or can he be hurting himself when it is cool (for example, like an athlete who takes painkillers doesn't know when to rest). My 11-year-old, Murphy has bad hips and knees but he still loves going on walks - especially to the park close to our house. It's about a 1/3rd mile walk to the park, then we walk a trail that is about 1/3rd mile in length, then we head back home. Yesterday morning, he seemed a little more stiff than usual. I decided to cut our trip short and head back home before finishing the loop at the park. He wasn't happy about turning around - he wanted to continue his normal route. But I decided that is was best for him to head back home before he got worse. He might have easily walked the 1/3rd mile loop, but I didn't know if he'd also make the 1/3rd mile trip back home. My other dog, Lupe also enjoys walks, but once in a while, she will go out, walk about 50 feet, potty, then head back home. I always allow this. Maybe something spooked her, maybe she was too hot, or maybe at 9 years old, she is starting to feel the effects of arthritis. I adopted Matt-Matt when he was about 7 years old. He used to have no problem walking an hour or two with me. A few years later (he is 13 now), he continued to walk an hour or two with enthusiasm, but sometimes 5 or 6 hours later, I would notice stiffness, and he'd have some trouble getting up after laying down for a while. So now, even though he seems to be easily handling our walks, I don't walk him more than 1 mile at a time. So, of my 4 dogs, Lupe is the only one who realizes her limitations. For the others, I have to assess their limitations and act in their best interest - even if they disagree. So could a dog over do it if he or she is excited about cooler weather, or squirrels or deer, or pedestrians walking by? Yes. That is one of the reasons we should not not leave dogs outside unattended for long periods of time. Not only might the dog be psychologically damaged from frustration, but the dog might also be hurting him or herself by getting too much exercise. Have you ever had a dog who appeared to be sick or in pain - until you get to the vets office? What makes the dog appear to be well at the vets office but sick or hurt when at home? Most likely, the answer is adrenalin. When a dog is scared or on-guard, or excited, pain symptoms can be masked. It's the same reason that our arthritic dogs have trouble getting up from a down position but will chase a squirrel or a tossed ball as if they are still puppies. So just because a dog can, doesn't mean he/she should. Observe your dog when he or she is at rest and let that be one of the determining factors as to how much exercise you will allow when the dog is excited. Also be sure to check in with your vet about what's safest for your dog. 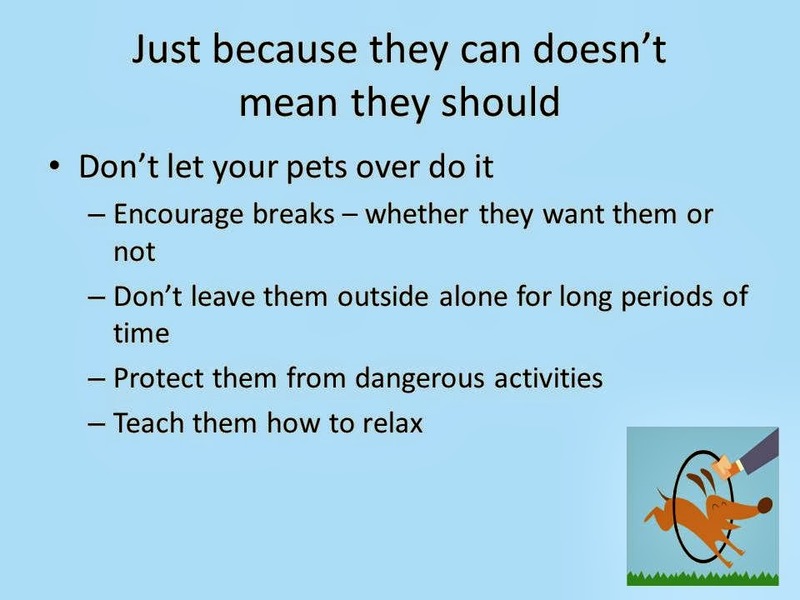 Which dogs are most at risk for over doing it? Just about any dog, really. But I'd be most concerned about biddable dogs (who will keep going as long as we keep doing), tenacious dogs (like a lot of terriers), reactive dogs, working dogs, and dogs with high prey drive. Some dogs don't know how to relax. They might run around because they don't know what else to do. What if your dog is in great shape? So, let's say you've checked in with your vet and your dog is great shape. 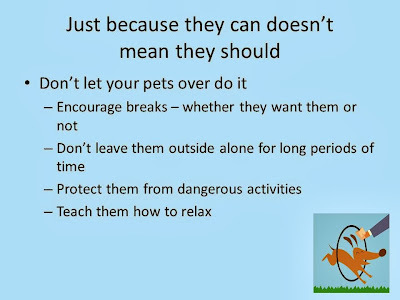 And you've also taken the time to slowly build up your dog's muscles and endurance. Does that mean your dog can now do back flips? No! Even the best conditioned dogs can still partake in activities that are just too dangerous. "Just because they can doesn't mean they should." Great phrase (for people, too). We enjoyed your post and the video. To add to Emily's video, I think we should ask if it's for us or them about more than tricks. For example about getting a dog ("am I getting a puppy to be cool with the chicks or because I really want one and am willing to take the time to provide him a good life? "), picking out a breed ("is an Akita the best breed for my lifestyle or am I getting one to be a tough guy? "), etc. I really like your blog and Emily's videos, it's obvious she and you really care a lot about dogs. Good point @Not. I agree. When I'm at work, I assume my dog is sleeping/resting. It occurred to me that he may be barking, stressed, running through the house, etc. Should I put a cam in the house to see what he really does when I'm gone? I think a camera is a great idea. I've put one up a couple of times - normally when I've implemented some type of change. Also, when I first got Puddin, I kept her in a crate. At one point, I was coming home to find her soaking wet but her water bowl was still full. So I filmed her and discovered that being crated while I was gone was very stressful for her. She was drooling immensely - so much so that she was getting drenched in her on spit. I stopped crating her and started working on crate acclimation. While I think cameras are a great idea, I wanted to add that often times, there will be signs that a dog has had a hard time while we were gone. In Puddin's case, there was the great amount of drool. Thank you for the info. My dogs love classical music, I have no idea where they got that from.